IT Security or Information Security has steadily grown from being an obscured field of work in some government or military or financial institutions to become a mainstream activity practiced by many professionals including myself. The growth of Internet and the challenges that come with securing the ever growing interconnected digital world along with the anonymity the WWW provides, has been thrown some unique challenges to the modern IT Security professional. We have also seen an explosion of various laws such as Sarbanes Oxley (SOX), the Health Insurance Portability& Accountability Act (HIPPA), the Gramm-Leach-Bliley Act(GLBA), the Payment Card Industry Data Security Standards (PCI) have only served to raise the profile and a huge demand for skilled and experienced Information Security Professionals around the planet. The demand for an IT Security Professional is not going to die down any time soon but instead keep growing because of the constantly changing and mutating threat landscape in the form of data migration online, ubiquitous connectivity and the global interconnected world we live in. 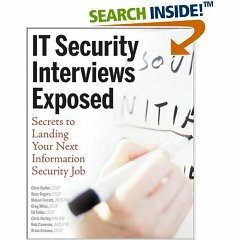 With this the book IT Security Interviews Exposed by Chris Butler and Wiley publishers let you into the world of IT Security Interviews .. all 218 pages of insight.